Photographer, High Street, Lewes. In the late 1920s Benjamin Reeves was assisted by his son, Edward Reeves, who was named after Benjamin's father. During the 1930s Edward took on more and more photographic work, effectively replacing his father as the main stay of the business. Benjamin died in 1948 and Edward then assumed full control of the business until his own death in 1980. Edward's wife took over for the next two years until their son, Tom Reeves (born 1960), finished his training and in 1982 was able to carry the business forward. Each generation of the Reeves family has lived in the same High Street house, and kept the studio as nearly as possible in its original condition, retaining some of the old cameras, props and furniture, while incorporating the latest technology. The second Edward Reeves was a gifted landscape photographer. 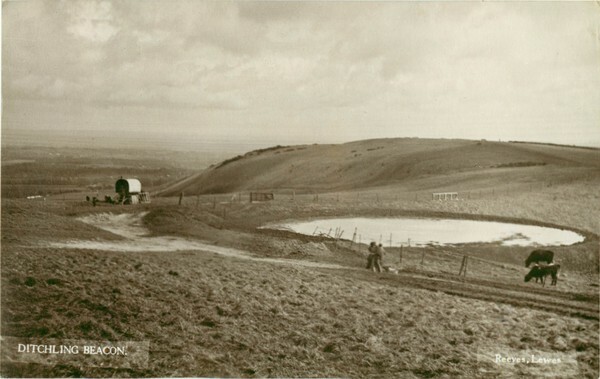 During the late 1930s, he began selling mostly sepia-tinted cards of Lewes and other places, mainly on the Downs. The photographs are skillfully composed and highly artistic. Interestingly, only a small percentage of the cards that survive today have been postally used. The rarity of postmarks suggests that the cards so impressed the original buyers that they were reluctant to part with them to send to correspondents! Judging from postmarks, the sepia-tinted cards first went on sale in the summer of 1937. However, a card of Glyndebourne Opera House has come to light with a handwritten date "July 1, 1936" added by a former owner on the front, which may possibly record when it was purchased. The titles of some of the cards are handwritten, others machine printed, normally on semi-transparent overlay strips. On many cards the overlay strips are barely noticeable, but sometimes they are intrusive. In nearly all cases, the titles are followed, on the right hand sides of the cards, by the words "Reeves, Lewes". A notebook survives in which Edward Reeves listed the titles of all his cards. There were 174, including a few cards of North Wales that remain little known and were probably issued in very small quantities. The family often holidayed in Wales, and Reeves may have supplied the cards to a single retailer, who may have had just one shop. All the Sussex cards were available for purchase at the Reeves Studio in the High Street in Lewes, and with very few exceptions nowhere else. They were displayed in a large wooden rack on the west wall of the small front room that acted as a shop. Most of the villages photographed by Reeves were represented by a single card, because the intention was to provide Lewes customers with as big a choice of Sussex locations as possible, and not to supply village shops with a range of views of each village. An exception was Jevington, where a Reeves relative held the pub, and was able to sell cards showing not just the pub but also the village and Downs. A card of Steyning Youth Hostel, others of the Old Priest House at Coldwaltham near Pulborough, and a series of cards of Pear Tree Farm at Laughton that served teas were presumably also sold on site. The pictures on a few of the Edward Reeves cards are known to have been taken before the mid 1920s, presumably by his father, but the majority almost certainly date from the mid to late 1930s. A few are definitely post-war. Card production was abandoned in the late 1950s or early 1960s. In addition to the real photographics, the Reeves Studio also issued a halftone card of Fletching Church. Since 1858 the Reeves Studio has taken over 200,000 photographs. The negatives are still held in its storeroom, apart from some that were sold by the second Edward Reeves to the Sunday Times in 1969, which are now in the care of the Sussex Archaeological Society. All the early negatives are collodion coated glass plates. Acknowledgement: Grateful thanks are extended to Tom Reeves, who has provided much useful information.